TVLP Institute develops conferences and other opportunities to spread the Silicon Valley entrepreneurial culture in the world. These events are generally developed in cooperation with TVLP Global Alumni Community, the alumni network of TVLP with members from all continents and 30+ countries. Working with IEEE-TEMS and an European University we are developing a large conference on innovation and entrepreneurship for Spring 2020. Expected kick-off event Winter 2019. 2017 Alumni event in ZhongShan, Guandong, China during the "Zhongshan Annual Business and Investment Conference"
Zhongshan Annual Business and Investment Conference as well as the 4th "Zhongshan Talent Festival" held opening ceremony in Zhongshan, China on March 28, 2017. This annual event enables a great docking between domestic, European and American startups and entrepreneurs. Mr.Chen Rugui, Party Secretary, Mr. Jiaolansheng, mayor of Zhongshan attended the meeting and gave speeches. A total of 158 contracts were signed during the event, and the total amount on investment contract was about 250 billion yuan, including 55 foreign projects, with the total investment of 4,643 billion US dollars; 103 domestic and foreign projects, with a total investment of 192.38 billion yuan, which achieved breakthroughs on former records. There are 2,352 export trade contracts, which makes turnover of $ 2,726,000,000. And 17,817 Domestic trade contract transactions, which makes turnover of 5,532 billion yuan. 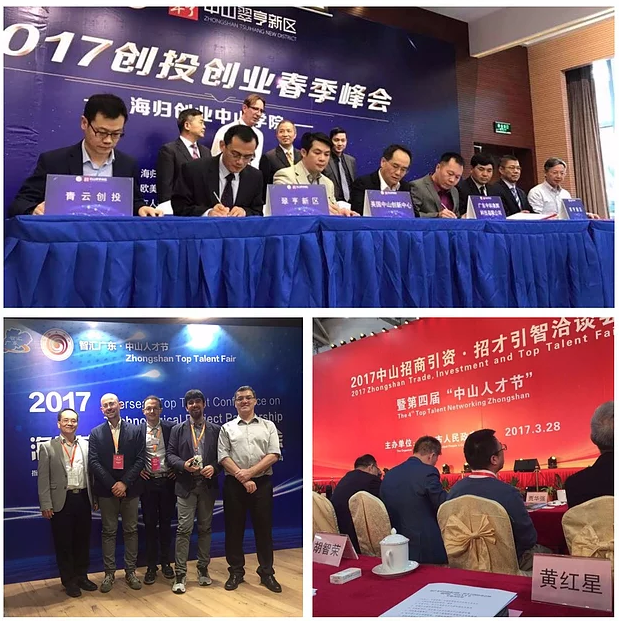 An international group of TVLP alumni were selected by Zhongshan city to attend the event and discuss with local investors. This project was a cooperation with ZhongShan.us based in San Jose, CA. Anticipating the Future was the first TVLP conference. It took place in Berlin in Fall 2016. The conference was an opportunity to discuss innovation and technology with TVLP alumni, guests from Silicon Valley, and local attendees from Berlin as well as from other European countries. Attendances had the opportunity to learn about the Silicon Valley Mindset and share their ideas between international innovators. This non-profit initiative was part of the Reunion of TVLP International Alumni, organized by TVLP.co in conjunction with the Fraunhofer IZM of Berlin.